Panasonic's TM700 hi-def camcorder offers us the technology equivalent of a Faustian bargain: you get excellent sharpness, at the cost of color accuracy. The TM700 shoots 1080-60p video, the first consumer camera to do so with any competence, matched with not one but three 1/4" CMOS sensors, one for each of the three additive colors, red, green, and blue. Unlike most consumer camcorders, which employ only one sensor, the TM700 sees the world as it is, with no need to use Bayer Interpolation to calculate color. Pair progressive scan recording with a true RGB sensor and you get dramatic, best-in-class sharpness. So good is the detail, in fact, I often export still frames from TM700 video footage and use them as if they were shot with a regular camera. The sheer level of detail of the TM700's picture is often astonishing. So what's the catch? Unfortunately the TM700's sharpness does not necessarily translate into a subjectively appealing picture. First, the camera's built-in stabilization is only adequate, and with this level of sharpness, it needs to be great. The TM700's OIS seems particularly vulnerable to rotational motion (about the frame's z-axis), which is exacerbated by the camera's cylindrical body shape and size, and which also happens to look particularly amateurish on-screen. Fine, you say—use a tripod. Problem two is the more vexing one: the TM700 has an incompetent auto white balance engine, resulting in color casts that are always noticeably off, and often actively offensive. You will notice sickly blue-green tints on nearly all shots made using auto white-balance, and the color curves are off by a wide enough margin to compromise color correction in post (an issue made worse by the bit-narrow AVCHD color space). Workarounds? Obviously, you can manually white balance the camera. However, if you're looking for a run-and-gun camera so you can chase your backcountry friends, stopping to white balance the camera before each and every shot just isn't a practical option. You can also manually set a fixed white balance, such as Daylight, which will not be perfect, but will leave a little more headroom for color correcting in your editing suite. Either way, color is going to continually vex you. The irony, of course, is that the 3-chip TM700 ought to be outstanding when it comes to color. With true 1080-60p recording, a 35mm wide angle lens (35mm equivalent), excellent low light performance, pro-caliber sharpness, and a relatively compact size (2.59" x 2.71" x 5.43"), the TM700 ought to be the slam-dunk of consumer camcorders. Instead, you will find yourself trapped between admiring its assets and hating its weaknesses. As much as I've tried to find a replacement for it, however, the TM700 remains my primary working camcorder. The crispness and picture clarity are not easy to give up. Note that the TM700 is being phased out in favor of the newer TM900. All reports suggest the cameras are essentially identical, aside from the 900's optional 3D capability. I am hopeful we will see an authentic competitor to the TM700 from Canon in the near future. 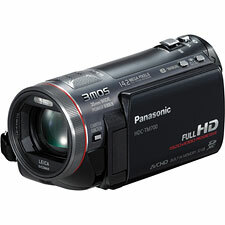 Until then, despite its problems, the TM700 will likely continue to rule the progressive camcorder universe.